1. Albanese F. Atlante di citologia dermatologica del cane e del gatto. 2010 Merial. 2. Bardagì M., Fondevila D., Ferre L., (2012). Immunohistochemical Detection of COX-2 in Feline and Canine Actinic Keratoses and Cutaneous Squamous Cell Carcinoma. Journal of Comp Pathol, 2012; vol. 146, n 1: pp. 11-17. 4. Belluco S., Brisebard E., Watrelot D., Pillet E., Marchal T., Ponce, F. Digital Squamous Cell Carcinoma in Dogs: Epidemiological, Histological, and Imunohistochemical Study. Vet Pathol, 2013; vol. 50, n. 6: pp. 1078-1082. 5-Bexfield N., Stell A., Gear R., Dobson J. Photodynamic Therapy of Superficial Nasal Planum Squamous Cell Carcinomas in Cats: 55 Cases. J Vet Int Med, 2008; vol. 22: pp. 1385-1389. 6. De Vos J. P., Burm A. G., Focker B. P. Results from the treatment of advanced stage squamous cell carcinoma of the nasal planum in cats, using a combination of intralesional carboplatin and superficial radiotherapy: a pilot study. Vet and Comp Onc, 2004; Vol. 2: pp. 75-81. 7. Gasymova E., Meier V., Guscetti F., Cancedda S., Roos M., Rohrer Bley C. Retrospective clinical study on outcome in cats with nasal planum squamous cell carcinoma treated with an accelerated radiation protocol. BMC Vet Res, 2017; vol. 4, n. 13 (1): pp. 86. 8. Gill V. L., Bergman P. J., Baer K. E., Craft D., Leung C. Use of imiquimod 5% cream (Aldara™) in cats with multicentric squamous cell carcinoma in situ: 12 cases (2002–2005). Vet and Comp Onc, 2008; vol. 6: pp. 55-64. 9. Goodfellow M., Hayes A., Murphy S., Brearley M. A retrospective study of 90Strontium plesiotherapy for feline squamous cell carcinoma of the nasal planum. J Fel Med Surg, 2006; vol. 8, n. 3: pp. 169-176. 10. Ierace M. K., Canfield M. S., Peters‐Kennedy J., Kane C. W. Combined carbon dioxide laser and cryosurgical ablation of rostral nasal septum squamous cell carcinoma in 10 dogs. Vet Dermatol, 2018; vol. 29: pp. 431-e142. 11. Lana S. E., Ogilvie G. K., Withrow S. J., Straw R. C., Rogers K. S. Feline cutaneous squamous cell carcinoma of the nasal planum and the pinnae: 61 cases. J Am Anim Hosp Assoc, 1997; Vol. 33, n. 4: pp. 329-332. 12. Lino M., Lanore D., Lajoinie M., Jimenez A., Crouzet F., Queiroga F. L. Prognostic factors for cats with squamous cell carcinoma of the nasal planum following high-dose rate brachytherapy. J Fel Med and Surg, 2019; https://doi.org/10.1177/1098612X18822409. 13. Luff J., Rowland P., Mader M., Orr C., Yuan H. Two Canine Papillomaviruses Associated With Metastatic Squamous Cell Carcinoma in Two Related Basenji Dogs. Vet Pathol, 2016; vol. 53, n. 6: pp. 1160-1163. 14. Mauldin E. A., Peters-Kennedy J. Integumentary System, IN: Jubb, Kennedy & Palmer's Pathology of Domestic Animals: Volume 1 (Sixth Edition), Editor (s): M. Grant Maxie, W. B. Saunders, 2016, Pages 509-736. e1. 15. Millanta F., Andreani G., Rocchigiani G., Lorenzi D., Poli A. Correlation between Cyclo-oxigenase. 2 and Vascular Endothelial Growth Factor Expression in Canine and Feline Squamous Cell Carcinomas. J Comp Pathol, 2016; vol. 154, n. 4: 297-303. 16. Miller W. H., Griffin C., Campbell K. L. Neoplastic and Non-neoplastic tumors. In: Muller and Kirk's Small Animal Dermatology, 7th Edition. Elseviers, 2013, pp. 774-844. 17. Munday J. S., Benfell M. W., French A., Orbell G. M., Thomson N. Bowenoid in situ carcinomas in two Devon Rex cats: evidence of unusually aggressive neoplasm behaviour in this breed and detection of papillomaviral gene expression in primary and metastatic lesions. Vet Dermatol, 2016; vol. 27: pp. 215-e55. 18. Murphy, S. Cutaneous Squamous Cell Carcinoma in the Cat: Current understanding and treatment approaches. J Fel Med Surg, 2013; Vol. 15, n. 5, pp. 401-407. 19. Nagamine E., Hirayama K., Matsuda K., Okamoto M., Ohmachi T., Uchida K., Taniyama H. Invasive Front Grading and Epithelial-Mesenchymal Transition in Canine Oral and Cutaneous Squamous Cell Carcinomas. Vet Pathol, 2017; vol. 54, n. 5.: pp. 783-791. 20. Pestili de E. M., Piché C., Sirois J., Doré M. Expression of Cyclo-oxygenase-2 in Naturally Occurring Squamous Cell Carcinomas in Dogs. J Histochem Cytochem, 2001; vol. 49, n. 7: pp. 867-875. 21. Ravens P. A., Vogelnest L. J., Tong L. J., Demos L. E., Bennett M. D. Papillomavirus‐associated multicentric squamous cell carcinoma in situ in a cat: an unusually extensive and progressive case with subsequent metastasis. Vet Dermatol, 2013; vol. 24: pp. 642-645. 22. Spugnini E. P., Vincenzi B., Citro G., Tonini G., Dotsinsky I., Mudrov N., Baldi A.. Electrochemotherapy for the treatment of squamous cell carcinoma in cats: A preliminary report. Vet J, 2009; vol. 179, n. 1: pp. 117-120. 23. Stell A. J., Dobson J. M., Langmack, K. Photodynamic therapy of feline superficial squamous cell carcinoma using topical 5‐aminolaevulinic acid. J Small An Pract, 2001; vol. 42: pp. 164-169. 24. Théon A. P., VanVechten M. K., Madewell B. R. Intratumoral administration of carboplatin for treatment of squamous cell carcinomas of the nasal plane in cats. Am J Vet Res, 1996; vol. 57, n. 2: pp. 205-10. 25. Willcox J. L., Marks S. L., Ueda Y., Skorupski K. A. Clinical features and outcome of dermal squamous cell carcinoma in 193 dogs (1987‐2017). Vet Comp Oncol, 2019; pp. 1-9. 2https://doi.org/10.1111/vco.12461 [Epub ahead of print]. Nella pratica clinica, la diagnosi istopatologica della malattia cronica intestinale è difficile a causa della difficoltà nell'ottenere adeguati campioni duodenali. Allo stato attuale, nessuno studio ha valutato l'influenza della dimensione della pinza da biopsia sulla qualità del campione nei gatti. 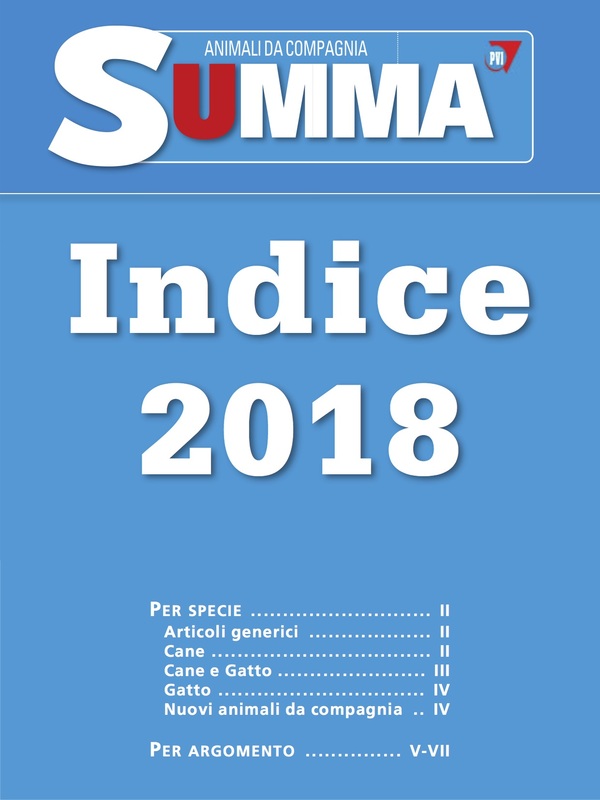 Nell’articolo dal titolo “Efficacia e sicurezza di un prodotto spot-on a base di imidacloprid e moxidectina nel trattamento della capillariosi nasale del cane”, pubblicato su Summa 10/2018 a pagina 44, la nota finale “Il presente articolo è stato pubblicato precedentemente su Veterinary Parasitology, 2017, vol. 116, Suppl 1, pp. 65-74”, è da modificarsi in “Il presente articolo è stato pubblicato precedentemente su Parasitology Research, 2017, vol. 116, Suppl 1, pp. 65-74”. Ce ne scusiamo con gli autori e i lettori.